I'm in the process of merging several catalogs into a Master Catalog from previous versions of LR, all was going well till I ran into a snag on one of my catalogs, "Lightroom could not import this catalog because of an unknown error" searched for an answer (Google and Adobe) and nothing seems to help. I did however realize it's a catalog that I've had issues with before and posted the problem here once before, I'm thinking if I resolve the old problem first, maybe then the catalog will merge as the others have. See attachment for I hope a better explanation of the issue with a particular catalog. Doug, I've never merged catalogs, but my first thought in this is that in the merge process, it's likely that all of the catalogs you're gonna merge must be in the same version of LR. Granted, when a new version of LR comes along, it may convert our database to comply with the new version, and it does that rather automatically. However, I would question whether the merge process has that conversion capability. Agree you should open all the old catalogs with your most current t version of lr. This should allow them to update. Then try to merge again. Hey Bruce, I've already merged catalogs from previous version with no major issues, I've been doing it in one of two ways, if you navigate to a catalogs location via Explorer (PC) Find (Mac), right click on it lrcat, then Open in "Adobe Lightroom" which is CC (not open with Lightroom X) it will convert old to a CC catalog, or open LR CC using Master Catalog, then >File>Import from Another Catalog, it will update old then import. Works great, all but this one in question. Did it, still getting error message...like I said it's only this one lrcat and I think it's the file structure hierarchy. Which as I mentioned, appears correctly in Explorer, just not in LR. My other lrcats came in just fine. Okay, then I'm stumped right now. 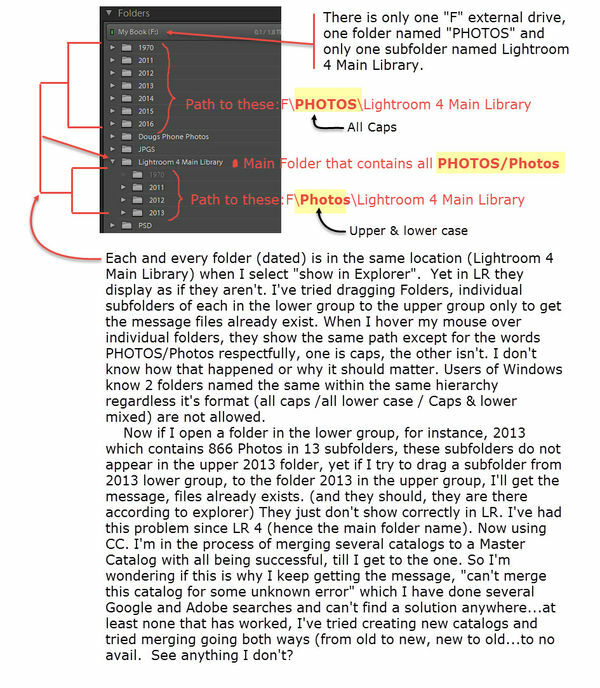 If you haven't, Google "Lightroom catalog merge problems" and see what comes up. Be sure to post the remedy when you find it. I'm curious about what may be happening. Not at all, I asked both on Google and Adobe before asking here, plenty of others asking about the catalog merge error but seems there are no answers, none that actually work that is. I'm pretty convinced my issue is because of the way either I or LR5 broke my catalog consistency as to the file structure. And there seems to be no answer to that either. Once I get past that, pretty sure it will merge. I'll keep you posted should a fix be found. I'm going to try something out of the ordinary tomorrow and see if that works. Yeah thanks...got a feeling I'm going to need it. It could be anything, but I do notice that your lower group of folders is a set of sub-folders under the PHOTOs catalog. Maybe you need to drag them out so that they are not sub-folders of that item but are main folders, as the above group is? Hard to know what has happened. However, whatever shows in LR is how you have it arranged on your hard drive. It simply mirrors your hard drive. Yup , could be anything, however as you'll notice in the attached larger snapshot, every folder (in Explorer) is upper level folders, both in the upper group as well as in the lower group. 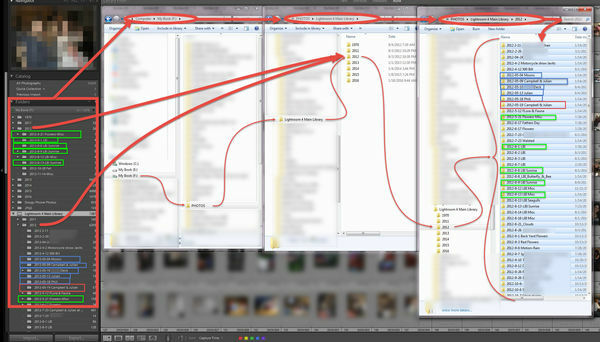 All paths point to same location on the F: drive, from the root directory down to the same folders/sub-folders. You will notice all my main folders 1970, 2011, 2012, 2013,2015,2015,& 2016 (1971 till 2010 are in a different catalog) are sub-folders in the folder "Lightroom 4 Main Library" residing in the directory named "PHOTOS" Now look at the two smaller snapshots of my mouse hovering over folders in the upper and lower groups in Lightroom, the paths are identical except one shows the directory called "PHOTOS" in all caps, and one shows it as "Photos" upper/lower case. This is what I think is the problem, yet again...anyway I search, view, open a file...there is only one file, no duplicates and they are all in the same physical location etc.